I think that these words give us a false sense of control. They are excuses we use to not feel guilty. It can’t be our fault if we just don’t have time. My granny always said, “Can’t (KANT)never could do anything!” She was so right because when we rationalize things, we can talk ourselves out of doing most anything. Can’t never could do anything because it is afraid to try! What if they succeeded? All those excuses would be lies; aren’t they lies anyway! “I won’t” is a form of rebellion. I won’t do that because it is not my time! Keeping score is so sad. All you are really doing is setting yourself up for a life of martyred living. Is that living or existing with a chip on your shoulder. It is so sad to go through each day wearing “I won’t” tattooed to your forehead. No one loves a martyr not even the martyr! When we do this to ourselves we put a cocoon of UN-cooperation around us for the world to recognize. Remember the commercial, “Mikey won’t eat it; he won’t eat anything!” The negativity becomes our persona. Now for the biggie! I don’t have time! Lies lies and more lies! We use this one more than any of them. It placates the guilt we have when we don’t think we have enough time to do it perfectly or the way we were taught how to do it by our perfectionist family members. We had this old saying shoved down our throats; If you don’t do it right then don’t do it at all! We took this one to heart. Especially when we were given a chore and it did not live up to someone else’s standards. Despite the fact that we were never informed of the standard. This is when we learned to say I can’t and even I won’t! We were afraid to try because somebody bigger than us forced us to clean the way they did! Well listen here! We don’t have to listen to those voices in our heads any more. Our houses can be cleaned without spending all day doing it! We can take a few minutes here and there and “hit a lick at a snake” as we say in the south! This means do something, anything to make a little progress. Progress is not perfection; it is just doing a little now to keep things from becoming a great big job and out of hand. Even if your home is overwhelming right this minute; you too can have it where you are only 15 minutes worth of messy to be ready for company. happily shared our lovely time with the reporter. I had dust mopped my floors, dusted, my hot spots were clear and my beautiful music was filling the air. She saw how I worked and lived. I was not ashamed to let her in the house! We even walked outside to Robert’s tree house. When your home is not weighing you down; you can spend time enjoying another person’s stories. As I walked her back to the front door she admired a walking stick that I had bought for Robert when I was on a trip. He had not liked it but really didn’t say so. She loves to hike; so I gave it to her. I got rid of clutter that we don’t love and she will use it and love it! These words “I can’t”, “I won’t” and “I don’t have time” bound us up in lies. Release the lies of perfectionism and what people will think and find that You can, You will, and You do have time to FLY! Are you ready to live in a can do world? 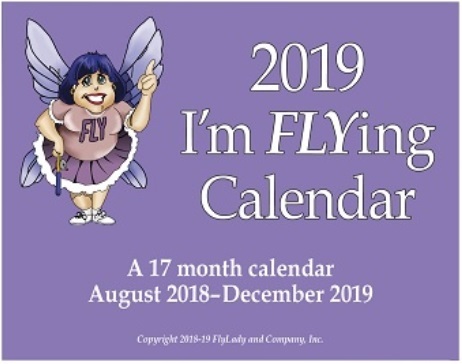 Get your 2019 Calendar ordered today? Use Coupon Code CLEAN461 to save 20%. This is a great tool to get rid of the CHAOS in your life! It has large squares for your busy family schedule! Be sure and get some magnets to put your calendar on your refrigerator. This entry was posted in Morning Musing and tagged flylady, get organized, rebellion. Bookmark the permalink.